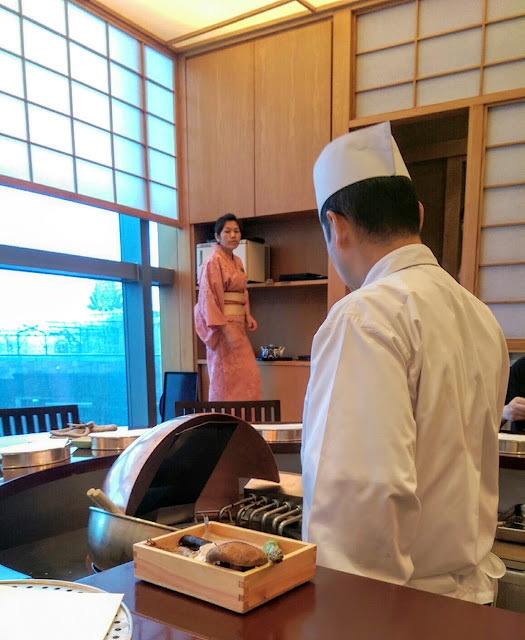 I went all out and chose the Hibiki "deluxe tempura set", which, aside from an appetiser, sushi, sashimi and dessert, had 8 pieces of tempura. 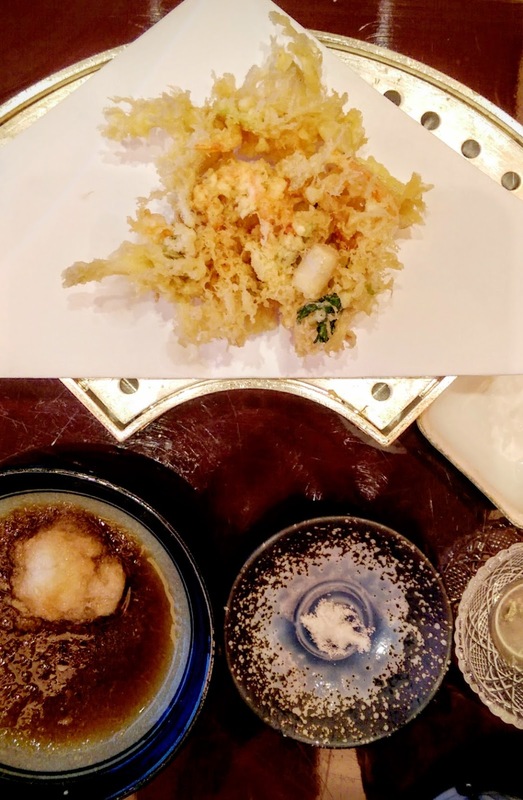 Let's make one thing clear - no matter how much you love tempura, or fried food in general, there is such thing as too much tempura, especially when your dining companion is G, who never eats a single crumb more than his stomach tells him to. 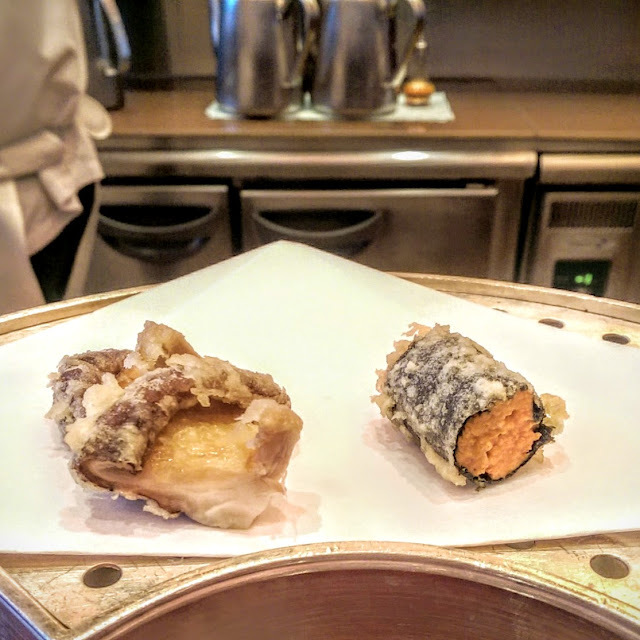 I couldn't get very good photos of all the tempura, so I won't post them all here, but of course, the uni was a highlight. I kind of wished I had some rice and something cold/cooler to go with it, although honestly, I could not have fit more food into me. Vegetable and prawn tempura "cake"
The final tempura was a killer. Just that alone and a bowl of rice would have been enough for a regular meal. 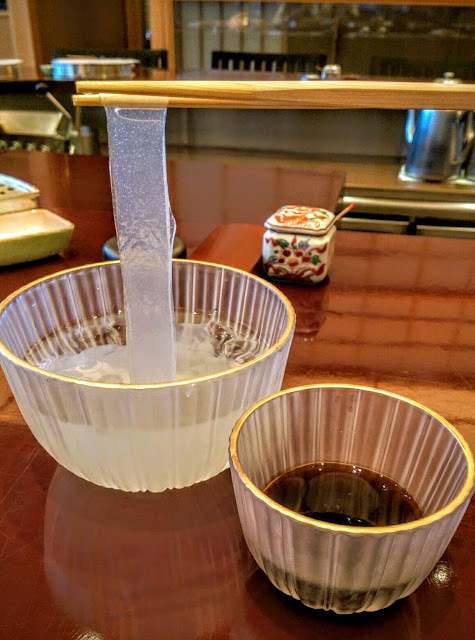 Alas we also had dessert - kuzukiri (kuzu (aka Japanese arrowroot) starch noodles with black sugar dip). A much needed cold and refreshing end to the meal. The black sugar dip was light and well-balanced. One of the few "traditional" Japanese desserts that is to my taste. (Normally there's lots of red bean, of which I'm not a huge fan - I know, I know, I'm not a good Asian). 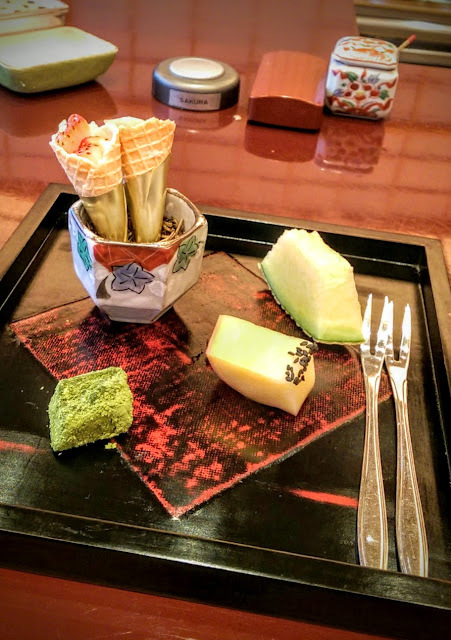 And of course, petit fours and a tiny wedge of honeydew that is the stuff of all honeydew dreams, directly from Japan. Tenmasa delivers a good experience, but don't go overboard like I did with the ordering (the grease does get to you, no matter how airy and light each piece seems), but do stick to the tempura, it's what they do best. * I paid for none of these meals, but I asked (and was granted permission, thank you CoD) to book and go anonymously, which is the way some restaurant guides work - take from that what you will - so it's good enough for greedy ol' me.